The two most major factors that will get your golf ball farther are the launch angle and ball speed. The initial launch of the golf ball and maximum height that a ball travels can greatly affect its carry distance! Getting the optimal balance between launch angle and spin rate will eventually determine the distance between the starting and end point of the ball’s launch. In this segment of Teaching with Technology, PGA Professional Todd Kolb uses Flight Scope Golf Technology to demonstrate the impact of higher launch angle on maximum height and distance traveled by the ball. Many teaching professionals use the latest gadgets and technology to calculate and improve their golfers’ launch angles and give them a better understanding of it’s impact on their game. Here, this tool is Flight Scope that uses radar technology to calculate the swing rate, launch angle, maximum height, and distance traveled by the ball. These stats are something that we simply cannot look at before, specifically the launch angle and maximum height. In this edition, Teaching with Technology, PGA Professional Todd Kolb uses the radar technology of Flight Scope to explain how the launch angle can alter the total distance covered by the ball. In this video above, you will notice how Todd Kolb uses Flightscope Golf Technology to measure the launch angle, maximum height, and distance covered by the ball along with its speed, spin rate, and time. Flight Scope can record various data for multiple shots and display them in a tabular format, to make it easy for you compare your every move. The Flightscope uses 3D Doppler tracking, high-speed image processing, and radar technology. As the moving ball will reflect some energy, the antenna radiations will pick up this energy and calculate the launch angle, maximum height, and other stats of your shot. Watch this video featuring Kyle Kunash and Flight Scope Launch Monitor. Todd starts this lesson by getting his two golf shots recorded with the Flight Scope Monitor, to set the stage and give us an example. The first golf ball that Todd hit carried 265 yards with an initial launch angle of 14 degrees (specifically 13.9 degrees), which means that the ball took off at an angle of almost 14 degrees. 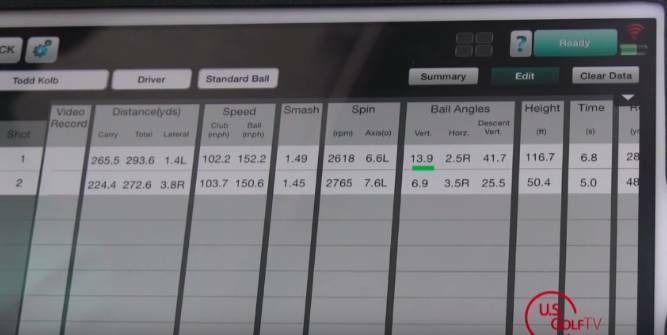 Todd hit the second ball at 7 degrees launch angle that traveled 224 yards, even though the “club head speed” was higher. The second ball traveled almost 40 yards less distance than the first ball. The major differentiating factor here is the ball angles, as the first ball that traveled 265 yards reached a maximum height of just over 116 feet in the air (which was a high launching low spin shot). The second ball that launched at 7 degrees and traveled 224 yards barely got to 50 feet in the air. The ball that took off higher, stayed higher, and was carried further. What does this mean for an average golfer and how can they use this technology to play better golf? 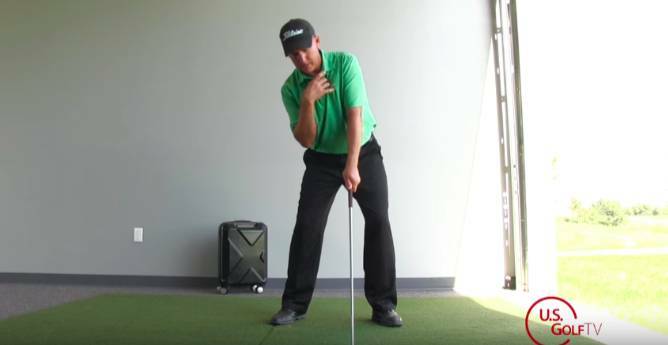 Tee the golf ball higher when you’re hitting your driver. See how Todd places the ball and the club to get a higher tee, which will eventually launch the ball higher. Take your upper body and spine, and tilt it away from the target that will help you launch the ball a little bit higher. See how Todd tilts his upper body away from the ball. These two tips will get the ball launch higher, higher in the air, and will carry it further. Using Flight Scope is just one example of how Teaching with Technology is helping every golfer reach their maximum potential.